Residents and staff at St Modans in Fraserburgh held a double celebration recently after success in both the Scottish Care Home Awards and the Pride of Fraserburgh Awards. Angela Armstrong, a care worker at St Modans, was presented with an engraved plaque after being named Carer of the Year at this year’s Pride of Fraserburgh Awards. Also being celebrated on the day was Meallmore’s success in the Scottish Care Home Awards 2015. Meallmore Ltd, owner of St Modans, was the proud recipient of the ‘Nutrition and Eating Well’ Award, which was selected from more than 300 entries. To recognise the part that each home played in the award success, the trophy reached St Modans on the latest leg of its Scotland-wide tour of the company’s care homes, to allow as many staff and residents as possible to share in the celebrations. Gail Hay, care home manager at St Modans Care Home, said: “It was a wonderful day for a summer fete and with two awards to celebrate everyone looked to be having twice as much fun. “Angela fully deserves her award and, like all of our carers, she goes above and beyond for our residents. 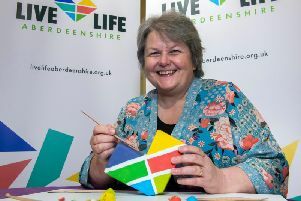 “It’s brilliant to have the community of Fraserburgh recognise her dedication. “The fete was also an excellent opportunity for residents and families to reunite for a special occasion, and enjoy our award-winning food.